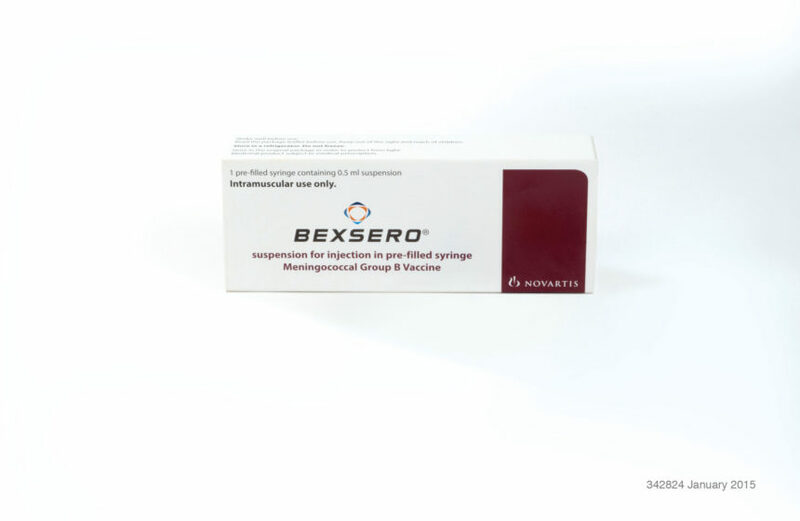 Neisseria meningitidis recombinant proteins 50mcg each of Neisserial adhesin A (NadA), Neisserial Heparin Binding Antigen (NHBA), and factor H binding protein (fHbp), 25mcg of Outer Membrane Vesicles (OMV); per 0.5mL; susp for IM inj. <10yrs: not established. Give by IM inj in deltoid muscle of upper arm. 10–25yrs: 2 doses (0.5mL each) given at least 1 month apart. Severe allergic reaction after a previous dose of Bexsero. May not protect against all meningococcal serogroup B strains. Have epinephrine inj available. Immunosuppressed. Latex allergy. Elderly. Pregnancy (Cat.B). Nursing mothers. Concomitant other vaccines: see full labeling. Inj site pain, myalgia, erythema, fatigue, headache, induration, nausea, arthralgia; syncope. To register women who receive Bexsero during pregnancy call (877) 683-4732.